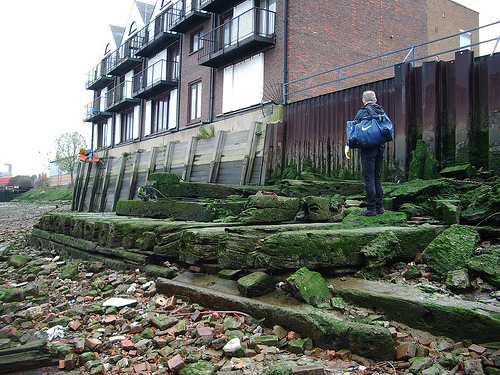 Thames Discovery Programme - Charlton, timber and iron ships..
Charlton, timber and iron ships.. 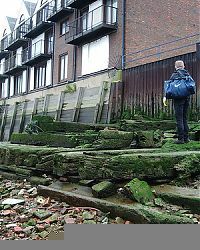 Preliminary research suggests that the timbers on the Charlton foreshore came from at least one of four ships, HMSs Duke of Wellington, Hannibal, Edgar and Anson. But what do we know of our suspected vessels and what clues do we have that will help us identify from which one(s) the timbers came? Duke of Wellington was a 1st rate ship of the line with 131 guns, the largest and most powerful ship in the world on her launch at Pembroke Dock, Wales in 1852. During construction she was cut apart and lengthened to take a steam engine and screw propellor. She served as flagship of the Baltic fleet during the Crimean War and later replaced HMS Victory as the flagship at Portsmouth until 1891. The other three ships were 2nd rate ships of the line mounting 91 guns each, designed as steam-and-sailing ships and launched at Woolwich and Deptford between 1854 and 1860. While HMS Anson was never fitted for sea, HMS Hannibal saw service in both the Baltic and Black Seas during the Crimean War, and HMS Edgar served as a flagship on the Channel, North America and West Indies, and Mediterranean stations. So we already know a little of our possible vessels, further documentary research should reveal more of their history and of the men that sailed them. Accurate scale drawings of the timbers should give us a chance to compare them with Admiralty shipwrights’ plans held at the National Maritime Museum and we may be able to work out from which parts of the ship they came, and, indeed, which ship they came from. 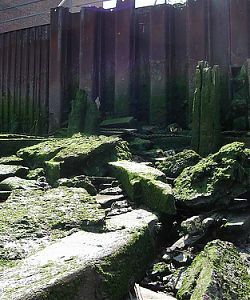 Not only are there ships’ timbers on the foreshore at Charlton; seemingly integral to the structure are large iron plates along with even bigger lumps of iron. 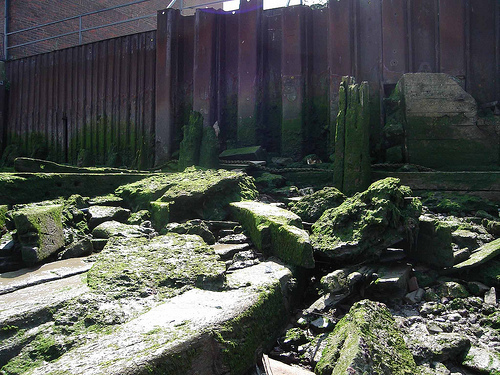 In the same year as our wooden vessels were broken up, so was a ship built of iron and protected by armour plate similar in size to the iron on the site. Her name was HMS Ajax), launched in 1880 at Pembroke Dock and was the last British capital ship built primarily of iron. In 1885 she entered the Baltic as part of a squadron engaged in ‘gunboat diplomacy’ with the Russians. So at Charlton we have archaeological evidence for one of the most revolutionary periods of naval development – in less than 40 years the ships of Nelson had been replaced by steel battleships, powered by steam engines and mounting huge guns. Apart from submerged shipwrecks, this may well be the only known evidence of vessels from this period in Europe.